IBC 2017, Amsterdam, stand 6.C19 – 7th September – Rascular, software designers of PC-based video playout control and media management systems across SDI and IP, is showing its latest control and monitoring technologies at IBC 2017. These provide flexible and cost-effective control of third-party devices across the playout chain, including streaming encoders. 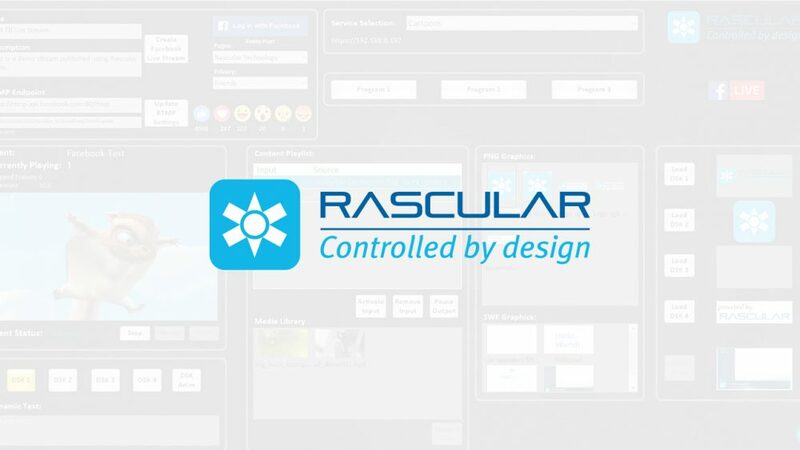 Rascular is highlighting its ability to provide direct control of streaming content to dominant social media platform Facebook Live using its flagship control technology Helm. This can be achieved via Helm on a PC or via associated, device-independent web panels. This allows a tight integration for broadcasters and playout providers between broadcast devices and streaming content. Operators can quickly and easily control both the streaming encoder and Facebook Live from a single screen. Helm communicates with Facebook using the latter’s Graph API. Because Helm supports all the Graph API features, an incredibly wide range of applications is possible, both for delivering content – including of course live video – and monitoring the audience for that content. Providing the flexibility required in modern broadcast facilities, Rascular is also showing its new web panel capabilities at IBC 2017. Alongside the flexibility that device independence provides, they also allow tight integration with live broadcasting to social media e.g. Facebook Live. Panels can be used in all modern browsers on mobile and desktop platforms. They also facilitate the remote control of services and equipment for pop-up and OTT channels and are ideal for integration with cloud-based encoding technologies. For existing Helm users, already created panel designs can be easily converted to Web Panels. Helm’s familiar drag and drop designer allows the easy creation of new panels to the user’s specification. Rascular is also showing its new, cost-effective solution to provide automated time-of-day router switching using a self-contained, PC-based router control panel, which provides both manual and automated time-of-day switching. Features include: Standard Router control panel(s); Clockwork dialog to set time-of-day switching; single PC licence; controls a single router up to 64 inputs x 64 outputs; and system configuration via the standard control panel. Rascular will also be highlighting its ongoing development of control technologies for hybrid and pure IP broadcast routers at IBC. Software designers Rascular create PC-based video playout control and media management systems. Bespoke or off-the-shelf, its applications work across SDI and IP technologies. This provides media companies with cost-effective control and management across hybrid playout environments. User-defined screen layouts allow precision access to on-air and off-air third-party technologies. This gives operators crucial touch-of-a-button control of manual and automated media preparation and channel playout, be that IP or SDI. Rascular’s technology is deployed by broadcasters and playout providers globally including Discovery Communications Europe, BSkyB, Red Bee Media, M-Net, Sky Italia and ARD. For more information visit www.rascular.com.